London - Oscar Pistorius might have seen his South African relay team's Olympic medal hopes go up in smoke, but the history-making double amputee described his Games experience as "phenomenal" and "humbling". Pistorius, who had both legs amputated below the knee before he was aged one because of a congenital condition, is known as the 'Blade Runner' because he runs on carbon fibre blades. The 25-year-old was cleared four years ago to run against able-bodied athletes when the Court of Arbitration for Sport (CAS) overturned a ruling by the International Association of Athletics Federations (IAAF) that his blades gave him an unfair advantage. And his participation in the London Olympics was a first ever for a double amputee, although his team finished eighth and last in the 4x400m relay final on Friday. 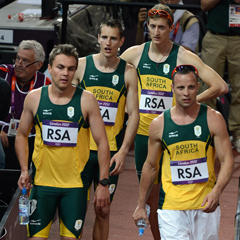 "The whole experience was phenomenal for us," Pistorius said. "To step out here for an Olympic final is more than I could ever have hoped for. It's been a truly humbling experience." There was an emotion-packed path to the final for the South African team, who failed to finish their semi-final after second-leg runner Ofentse Mogawane tangled with a lane-changing Kenyan, Vincent Kiilu. While Mogawane nursed a dislocated left shoulder, Pistorius thought his chances of running the Olympic final were over. But a successful appeal saw the South Africans reinstated in lane one of the nine-lane Olympic Stadium. "After yesterday, today can only be good!" said Pistorius. "I was so disappointed yesterday, so down, and there were so many mixed emotions. "We got back to the warm-up track and then heard Kenya were disqualified. "Then we found we could run in the ninth lane. There was an extra lane and they gave us that because we finished second in the world championships last year. We got reinstated." Pistorius added that relay team leader LJ Van Zyl had already headed for a plane back home when news came in of the green light for the final won by the Bahamas over the US team. "LJ was on his way to the airport and got called back to come and run," beamed Pistorius, who ran the fourth and final anchor leg of the relay team. "Representing my country and knowing I have to bring back home the baton meant I ran a lot harder. "It's always an honour to be the anchor, although quite stressful. I never get that much responsibility. I ran a very good back straight." Pistorius added: "It's a dream come true. It's the most amazing experience of my life, and it will inspire and motivate me for the next four years. "Just to take part has been great." Attention would now turn to the Paralympics, he said. "I am really looking forward to them. I think they will be the best ever. "It makes me stoked to come out here in this stadium again."